When you think of celebrating Thanksgiving with kids, what images come to mind? If your first thought is a group of bored cousins sitting at the kiddie table -- think again. Kids can enjoy many elements of this special holiday, from playing fun games to helping prepare the Thanksgiving feast. Kids love to cook, and almost any recipe has steps even young children can handle. Let them sprinkle marshmallows on top of the candied yams, or show them how to mash potatoes. 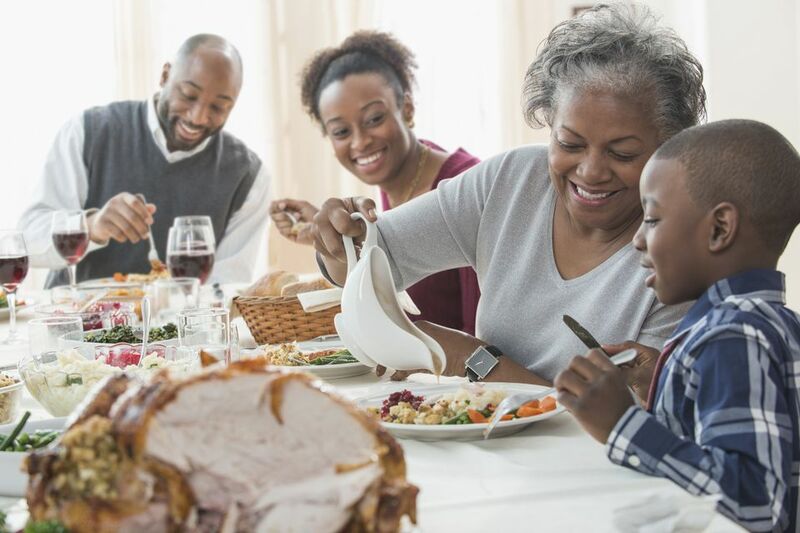 With some supervision, older kids could be put in charge of checking the turkey’s temperature every 30 minutes or so, and teenagers can prepare an entire Thanksgiving side dish from start to finish. Children also can be asked to set the table and decorate it, too. Have them make place cards ahead of time and gather items from the backyard for a nature-inspired tablescape. The moments before dinner is served can be stressful for many Thanksgiving hosts. It’s a tricky task to get everything on the table on time and at the right temperature. Plan some activities to occupy the children during that time, such as playing some Thanksgiving-themed games as led by an older cousin or gathering to watch a Thanksgiving-themed DVD, such as A Charlie Brown Thanksgiving or another family-friendly Thanksgiving flick. The kids also could use that time to prepare one final item for the table: scraps of paper and pens placed on each family member’s plate so everyone can write down the things for which they’re thankful. Once everyone shares their sentiments during dinner, have the children collect the slips of paper and store them in a special place, year after year. Tweens and teens certainly can be expected to sit through the entire Thanksgiving feast, but keep in mind that young kids -— on a purely developmental level -— simply cannot sit in one place for more than 10 minutes or so. A few crayons and some Thanksgiving coloring pages might keep them sitting there longer, but set a realistic expectation before dinner starts of how long you would like them to dine with the family. Then, excuse them if they’ve made it past that point and are starting to squirm. They’ll be glad to be set free, and you won’t spend the rest of dinner gritting your teeth. Get them to help with the after-dinner tasks. Everyone can be expected to help clean, even if a young child’s job is only carrying dirty napkins to the laundry room or wiping the table with a damp rag.You can make the cleanup a fun activity for all by playing some family-friendly music and having a group sing along as you clear the table and straighten up the kitchen. Think of other traditions you can incorporate into Thanksgiving to make it fun, such as an annual round of football games or an actual game of football with the neighbors. How about a morning “turkey trot” with the family? Another idea is to make watching the parade on television a Thanksgiving morning ritual, or have the kids create a fun little parade of their own through the house or yard. You can also help children learn the meaning of Thanksgiving by reading books about it during the days leading up to the holiday. In the days leading up to the big day, engage the kids in a pumpkin decorating activity. Another idea is to create thankful pumpkins. Give each family member a pumpkin on November 1st. On each day leading up to Thanksgiving, have them write something they are grateful for on the pumpkin. Spend Thanksgiving morning reading them and then use them as centerpieces for the dining tables. Journals are another great place to write down those blessings, which can be counted together as a family by reading aloud at the dinner table.